We’ve already had 20 wonderful Tudor treats, but there are 4 more to enjoy! 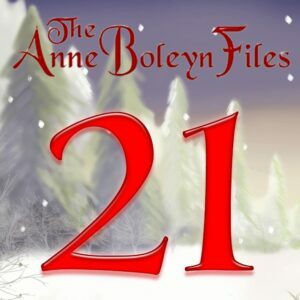 Today’s Anne Boleyn Files Advent Calendar treat is a yummy one from me. I’d highly recommend having a go at it and let me know if you do. We’re here until 24th with lovely Tudor-themed things for you to enjoy. Simply click on the number here in this post or use the link in the cover image of this website to enjoy today’s treat and the other 20. Thank you Claire. Chilly so most appreciated. I can’t believe it is already the 21st. Where has this last year gone? I know! I’ve only just got used to it being 2018 rather than 2017! We’re going to have to learn to put the correct year on check’s. AGAIN! The Solstice is here! Wassail!!!!!! Last year and the year before at Xmas they showed Fanny Craddock does anyone remember her? She was a right tarter and she really used to boss her hubby around when he appeared, usually with an apron on, she was making her mothers sherry trifle and Xmas pudding, her show was immortalised in the famous words her husband uttered once when she had made some doughnuts, ‘ goodbye and I hope all your doughnuts will taste like Fannys ha’! Yes I remember Fanny Craddock and the Galloping Gourmet but I really don’t watch cooking programmes now, unless there is some kind of cultural interest involved. I enjoy Rick Stein and his travel with food programmes, looking for local food and cooking. I particularly enjoyed his four part one in India and a weekend he spent in Spain. I don’t have time to make puddings now, but I do still do real cooking when I can. I have a Medieval Cook Book from when I was at University and we did food history and taboos which was interesting, making six dishes as part of the assessment. My seaweed soup was memorable because the tutor got the wrong type of seaweed and I had to improvise with another recipe to make it taste good. My Medieval three roasts was excellent with cherries and all kinds of delicious herbs. Anyway, have a good weekend and Merry Christmas. Thank you, Claire! Love your posts! I like the festive cookery programmes but they always use such a lot of rich ingredients, wine double cream etc, they look wonderful but must be highly calorific, I like Delia Smith and enjoyed watching her festive cookery series which was aired about 30 years ago, ‘Two Fat Ladies’ they were a laugh, but yes the Galloping Gourmet I recall my mum disliked his rather unhygienic habit of licking his fingers, and Fanny Craddock with her white powdered face and orange lipstick was a fright!